So I saw some cute and easy looking marshmallow crispie Mickey Ears over at Mrs Fox’s Sweets. She has a very cool and inspiring blog and this looked like something that was actually in our league to make. They were returned to the fridge in the vain hope of hardening. 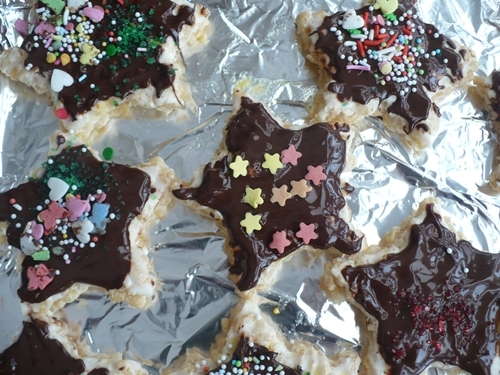 Two days later we added choclate and sprinkles. That was very sensory! 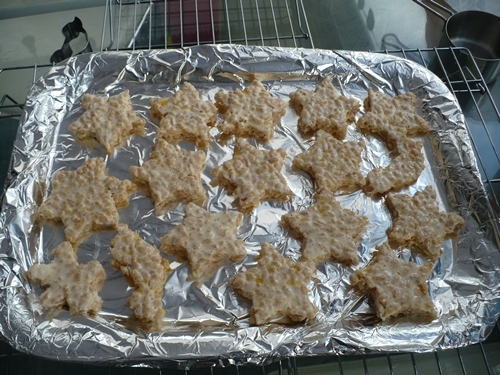 The stars were okay on top but soooo spongey and squidgey underneath. Everything styuck to everything else. and a lot of things got stuck to Oscar. Much handwashing but also some tasting anbd joining in which has to be good, right? I’m thinking it’s to do with the difference in marshmallow consistency between the UK and USA. Maybe more experimenting is required? Any one have a good UK based recipe to compare????? See the masterpiece(s) below. Goota love a 4 year old’s sprinkle selection! I never knew marshmallows were different overseas! Who knew?!? Either way, they still look yummy!